Recording of a huge chorus of periodical cicadas, Magicicada septendecim (scroll down for explanation and additional recordings!). © Lang Elliott. Have you ever been surprised by the sudden appearance in your neighborhood of tens of thousands, if not millions, of big, black, scary-looking bugs with red eyes and orange wings … crawling all over everything and making a deafening racket from the treetops? If you have, then consider yourself lucky … you’ve experienced the emergence of “periodical cicadas,” amazing insects that may show up in your area only three or four times in your lifetime! Enjoy them while they last, because when they disappear from the trees and shrubs, they won’t be visiting again for a very long, long time. 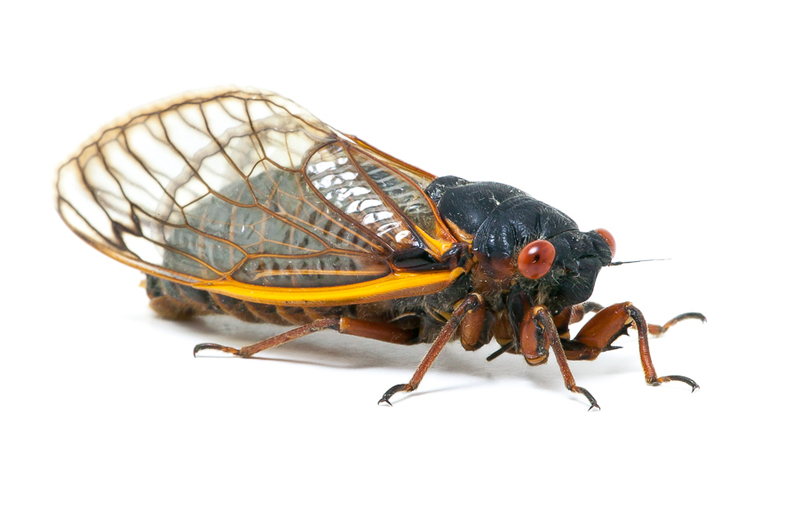 Basic Facts: Periodical cicadas are found only in eastern North America. They are unique in their combination of long, prime-numbered life cycles (13 or 17 years), synchronized mass emergences, and overwhelming choruses. There are seven species, all of the genus Magicicada — four with 13-year life cycles and three with 17-year cycles. The 17-year species are generally northern in distribution, while the 13-year species are generally southern and midwestern. All have black bodies, red eyes, and orange wing-veins, making them difficult to tell apart except by experts (although the songs of different species are distinct). Magicicada septendecim, the most common 17-year species, is also the most well-known to the general public. Why are they called Magicicada? … because they’re “magical” … indeed! 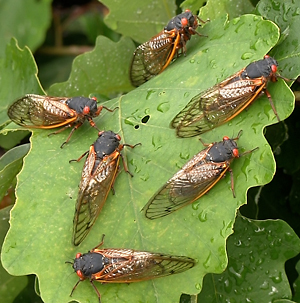 Annual Cicadas: There are many other cicadas in North America that are not periodical, meaning that individuals of these species emerge in reasonable numbers every year. These are called “annual cicadas” to distinguish them from the periodicals. This is not to say that individuals of annual species have a one-year life cycle. On the contrary, each individual may take many years to develop into an adult, but life cycles of individuals within a population are staggered so that some adults appear every year. 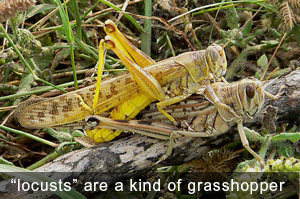 Are they “Locusts?”: Many people refer to periodical cicadas as “17-year locusts” or “13-year locusts,” but they are not locusts, which are a type of grasshopper in the insect Order Orthoptera. Periodical cicadas are a member of the insect Order Homoptera and are relatives of the aphids, planthoppers, leafhoppers, and shield bugs. Are they Dangerous to Humans? : Periodical cicadas may look scary, but they are actually quite harmless and do not sting or bite. You can hold one in your hand (or allow one to land on your nose) without fear. 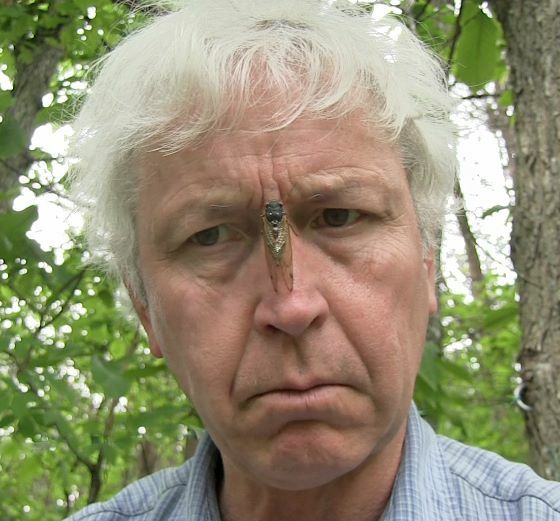 Adults have a proboscis that they insert into plant stems to extract sap, but it is unlikely that one would mistake your hand (or nose) for a stem. Given the lack of danger, there’s no reason not to treat them gently and respectfully. Myth and Culture: The uniqueness of the group has given them a special appeal and cultural status. Members of the Onondaga Nation near Syracuse, New York, maintain the oral tradition of being rescued from famine by periodical cicadas. Early colonists viewed them with a mixture of religious apprehension and loathing, even though they they posed no threat. Modern Americans are intrigued by them, and there are numerous websites to assist in planning weddings, graduations, and other outdoor activities around emergences. Some even consider them a delicacy, concocting recipes to reduce the crunchiness (though we wonder how anyone could take joy in eating such a beautiful creature). Cicada Mania: The periodical cicadas of eastern North America are unique among cicadas the world over. Nowhere else do cicadas exhibit such synchronous, periodic mass emergences. Those who live within their range are lucky indeed. Given their outlandish appearance, mysterious 13-year and 17-year cycles, extraordinary numbers, and the overwhelming loudness of their choruses, anyone who experiences a Magicicada emergence will be notably and irreversibly impressed … hopefully for the better! 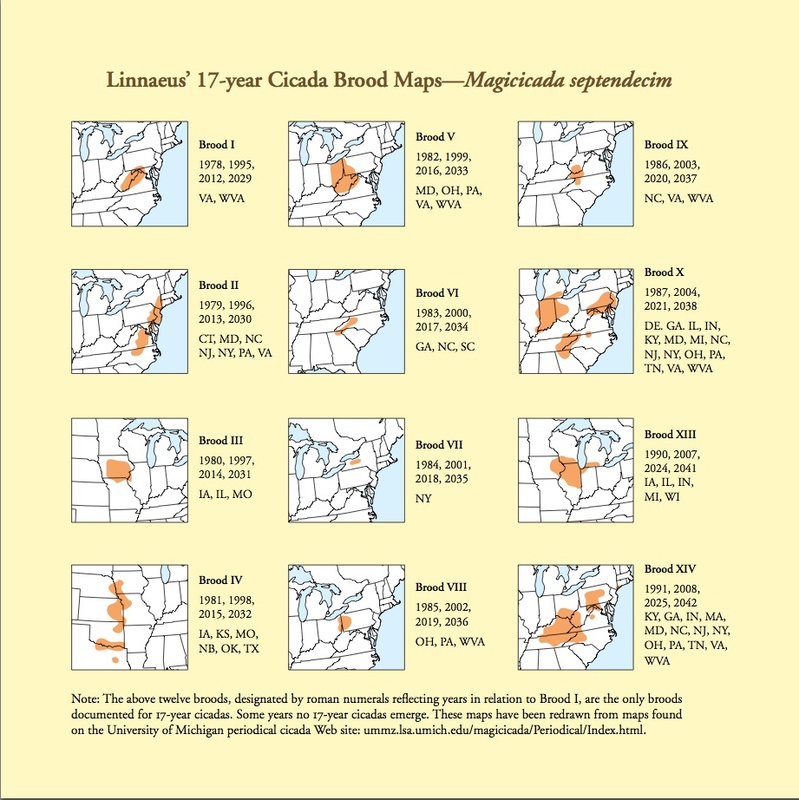 Range Maps for the 12 broods of the Linnaeus’s 17-year Cicada. Due to its liquid form Kamagra oral allegra 24 sail for sale jelly easily dissolves..